Money coming to the Auclair Lab from the other end of the world! Professor Auclair was recently awarded funding from the National Health and Medical Research Council (NHMRC) of Australia. The two co-applicants involved in this application, Prof. Auclair and Prof. K. J. Saliba from The Australian National University, will share approximately $185,000 per year for 3 years to work on "Understanding and targeting coenzyme A biosynthesis and utilization in Plasmodium falciparum". Key to this success was an established collaboration between the two research groups that led to the discovery of triazole-containing pantothenamide mimics which show low nanomolar growth inhibition of P. falciparum at the red blood stage (potency similar to that of chloroquine). 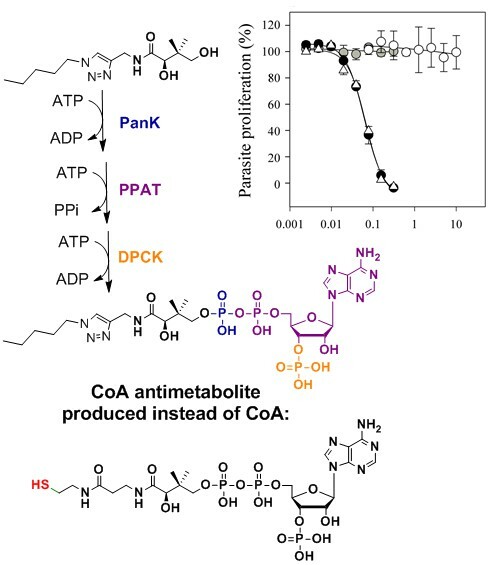 These compounds represent not only a new structural class of potential antimalarials, but they also act by a novel mechanism: they are coenzyme A antimetabolites. The funding secured from NHMRC will be used to cover the costs of further medicinal chemistry and P. falciparum studies, as well as preclinical investigations.